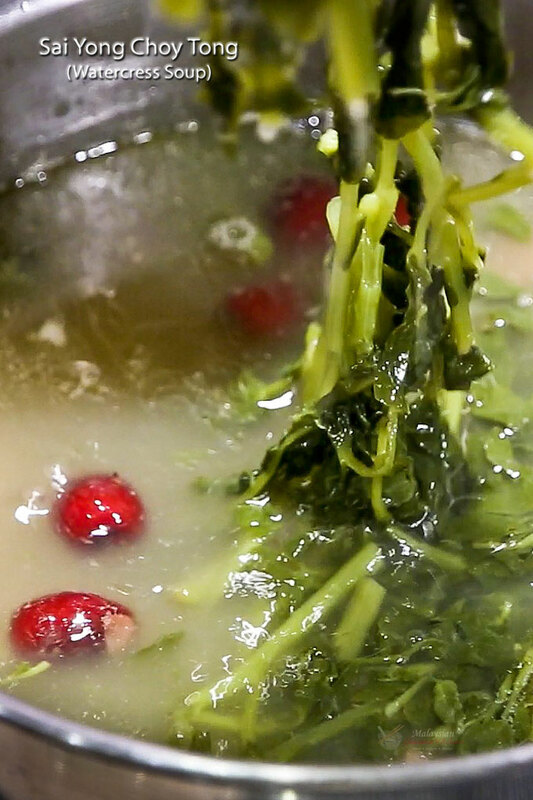 Sai Yong Choy Tong (Watercress Soup) is a slow boil, clear, and nourishing soup. It is very popular among the Malaysian Chinese. 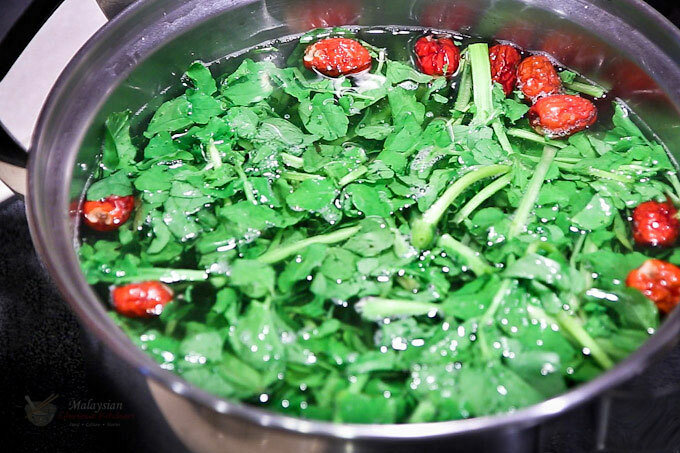 Slow boiled and nourishing Sai Yong Choy Tong (Watercress Soup) is very, very popular among the Malaysian Chinese. 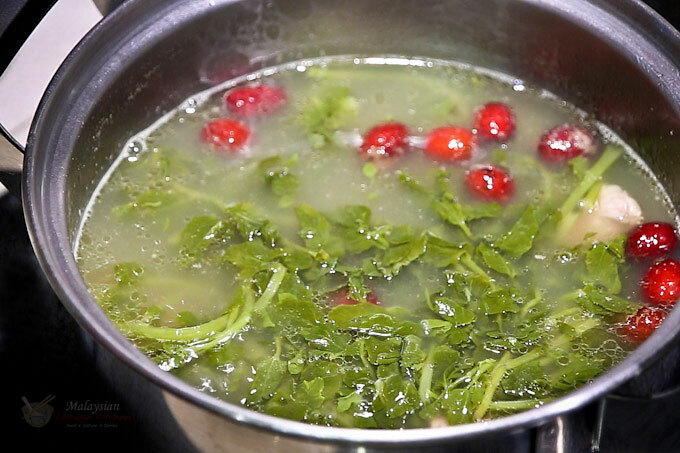 It is a very easy soup to prepare using only 3 ingredients (not counting water) – watercress, red dates/jujubes, and pork ribs. Chicken may be used in place of pork. This tasty and soothing soup is often prepared as a remedy for coughs and colds. In Malaysia, the Sai Yong Choy is of a larger species. The stems are longer and thicker. Over here, they are sold in tiny bunches, all nicely trimmed. One bunch is approximately 8 ounces (225g) in weight and is sufficient to make a pot of soup for 4 persons. You can use 2 bunches for a more concentrated flavor. Raw watercress is bright green in color with crunchy stems and a slight peppery taste. After boiling, they become very soft and turn an olive green color. By then, all their goodness would have been transferred to the soup and the vegetable may be eaten or discarded. Most people would serve some of it together with the soup. Simply add the rinsed goji berries to the soup 5 minutes before turning off the stove. I have seen some families adding a little goji/wolf berries to the soup. We do not usually do that in our family but you are certainly welcomed to do so if you like. Fill a large pot half full of water. Bring to a boil. Add pork neck bones or ribs. Allow it to blanch for 3 to 5 minutes. Remove with thongs and rinse in cold water. Discard water in pot and fill with 10 cups (2.4 liters) of fresh water. Bring to a boil. Add blanched neck bones (ribs), red dates, and watercress. Bring water back up to a boil. Reduce heat to low and allow soup to simmer for 1½ to 2 hours. Skim off any scum appearing on the surface. Season with salt to taste and turn off heat. Serve warm in individual bowls. 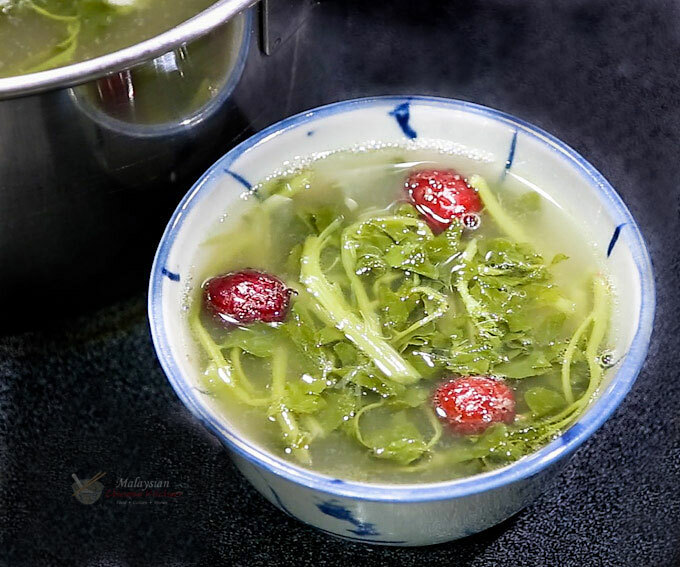 Sai Yong Choy Tong (Watercress Soup) is a home style soup seldom offered at the restaurants. It is very a light, soothing, and comforting soup. If you have never tasted it, I urge you to give it a try. I have tried your watercress soup recipe but my turnout taste a little bit bitter . Love this soup and used to drink this when young staying in my hometown Singapore.